The 31-year-old actor chats to us about his latest role. MOVE OVER LOVE/Hate – there’s a new scary late-night drama about criminals in town. RTÉ’s forthcoming four-parter Clean Break comes from the same stable as Love/Hate, but looks to tackle an altogether different kind of crime. The Sunday night show, written by Wexford playwright Billy Roche, is about a tiger kidnapping gone wrong, and the impact it has on the local community. 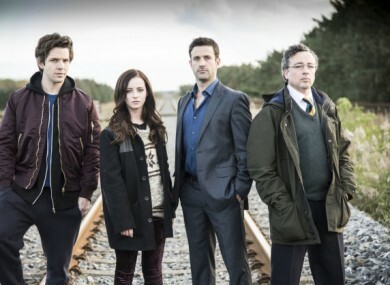 Set in Wexford, the cast includes Adam Fergus, Aidan McArdle, Simone Kirby, Damien Molony, Kelly Thornton and Ned Dennehy. “It’s a very, very exciting story and it’s very scary – certainly the first episode,” Molony (above) tells TheJournal.ie. Though based in London for the past seven years, Molony – who has also starred in Ripper St and Being Human – was tempted back to Ireland again when he discovered that Roche was at the helm of the script. “He is without a doubt one of the greatest Irish playwrights ever,” says Molony. Meanwhile, Gillies MacKinnon and Damien O’Donnell are “two amazing directors that I’ve wanted to work with for a long, long time”. This is Molony’s first drama for RTÉ, but because he’s based in the UK he’s not familiar with Love/Hate (which stars a number of his friends) – though he plans to borrow a friend’s boxset. “I can’t wait to finally sit down and watch it,” he says. Can he tell us about his character, Danny Quinn? “I think he’s a good guy thrown into the wrong circumstances,” says Molony. It’s a story of survival for my character Danny – he just makes the wrong decisions. He probably doesn’t have any real guidance. And the wrong decisions at the wrong time lead him into hot water. His character knows “everything is going wrong” but can’t do anything to fix it. “I love playing very troubled, tormented characters who have a huge amount at stake and have to make a tough decision and are constantly wanting to care for people but are being forced to do things against their will,” he says. Molony has just finished doing a play in the National Theatre, and has a new comedy on E4 starting on Monday. I just love working – I just want to keep that happening. I love being challenged by new projects and directors. I love working with very exciting storytellers because they make the best stories. Clean Break will debut this autumn on RTÉ One. Email “"It's exciting and scary": Meet one of the stars of new RTÉ drama Clean Break ”. Feedback on “"It's exciting and scary": Meet one of the stars of new RTÉ drama Clean Break ”.